← How to print txt to postscript file? 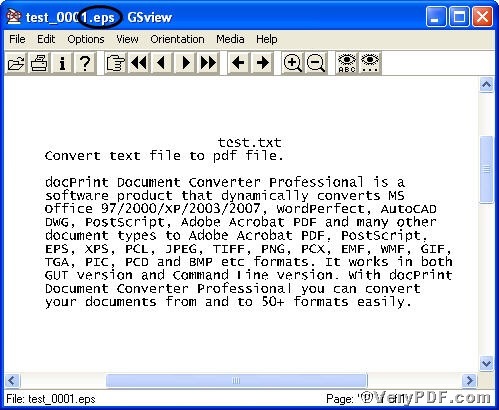 Follow the description of usage of docPrint Document Converter Professional, you will learn how to print txt to eps file. It has two divisions; one is docPrint, the other is docPrint PDF Driver. In the below part, the VeryPDF.com focuses the later one, docPrint PDF Driver and tells you how to print txt to eps file. 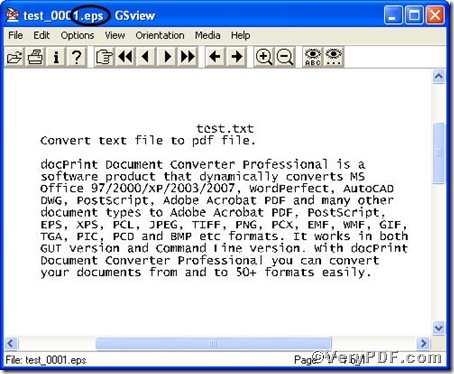 docPrint Document Converter Professional is a software product that dynamically converts MS Office 97/2000/XP/2003/2007, WordPerfect, AutoCAD DWG, PostScript, Adobe Acrobat PDF and many other document types to Adobe Acrobat PDF, PostScript, EPS, XPS, PCL, JPEG, TIFF, PNG, PCX, EMF, WMF, GIF, TGA, PIC, PCD and BMP etc formats. It works in both GUI version and Command Line version. With docPrint Document Converter Professional you can convert your documents from and to 50+ formats easily. Click “file”, where you can find print option. Choose “Print”, here you can use hot key Ctrl+P. Choose “docPrint PDF Driver”, using docPrint PDF Driver to print txt to eps. Save in output file, saving eps file in a place where you can find obviously. Name output file, naming eps file as the name you like. Select a a format for output, eps, there are several formats for you to choose, in this article, eps. Save the changes, when you ensure all changes correct, press “save”. This picture tells you the printing txt to eps proves to be successful. 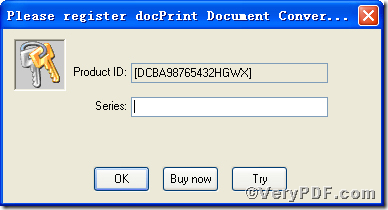 Overall, the docPrint PDF Driver is effective in printing txt to eps. There are two ways to experience docPrint PDF Driver: one is to press “try”, the other one to press “Buy now”. The former one means you are entitled 100 times free of charge to experience this wonderful software. The latter one means you purchase it for permanent use. Once again, having convinced docPrint Document Converter Professional meets your needs, you are strongly encouraged to purchase and register your copy of the software by acquiring a personal unlock key, the demo version has watermark in the generated PDF file, see above picture. If you have further questions on docPrint PDF Driver, you are welcome to come into live support for help. How to print RTF to PDF? This entry was posted in docPrint Pro and tagged docPrint Document Converter Professional, docPrint PDF Driver, txt to eps. Bookmark the permalink.